Marco Werner was at the start of this year’s edition of the Jim Clark Revival. The Le Mans winner of 2005, 2006 and 2007 moved a Formula 1 Tyrrell 017 from 1988/89 during presentation rides of Raceclub Germany. 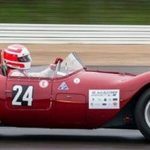 The traditional event is the start of the season of historic motorsport and attracts many thousands of spectators who enjoy the speed and, above all, the sound of the old cars. Marco Werner was not only in Formula One on the road. 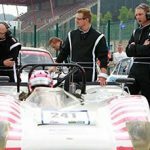 As a sports car legend, used to vehicles with high power and high top speed, the three-time American Le Mans champion also participated in the FIA ​​Lurani European Championship Formula Junior. Over thirty cars were registered and promised exciting sports. The vehicles of the late fifties to 1963 make for thrilling races. Werner started with a newly restored Lotus 22, which was built at Britec Motorsports and only on Thursday morning in Unna was the first time on the wheels. Although the car had a so-called roll out for the first time on Thursday evening, Werner finished seventh on Friday with only a few laps. 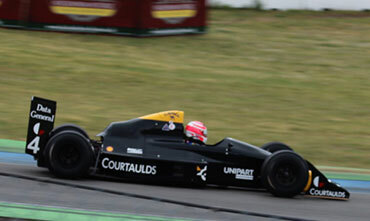 In race one on Saturday, however, Werner immediately interfered with the experienced drivers of Formula Junior in the top group. “Britec Motorsport has built a super nice car. It’s not just a feast for the eyes, it’s also competitive from the first few laps. The first laps were a lot of fun, “says Marco Werner. But without so-called teething troubles, no new racing car can make ends meet. Especially not if it is built in 1962. So there were problems with a new engine, which came specially from England from a Toptuner of the series. But the crew of Britec showed as usual use. Thus, the damage to the cylinder head gasket was resolved on the first evening and it went on. Starting from seventh place, Werner even fought for the lead in lap 5. The first four showed the spectators a great race. But oil loss and sprayed with the cockpit made Werner a dash through the bill. While trying to slow the leader Philipp Buhofer, Werner got briefly between the pedals, touched Buhofer and turned. In his recovery, already back to fifth place, Werner turned again and had to give up the race. Too bad that I had problems with a leaking oil tank, which oiled me the whole cockpit around the pedals. We had it in our hands, maybe the first time we used the new car to win directly. Many thanks to the team Britec Motorsports and especially to my mechanic Andy Michael, who set up and cared for the vehicle with great passion. His effort was unfortunately not rewarded. But despite everything, we are very satisfied. Actually, you should not expect that you drive with a newly built car directly in the front, “said Werner with pride.